This DoubleTree cookie recipe is my absolute favorite chocolate cookie recipe. I have made these cookies hundreds of times, given them as gifts to friends and mailed them in care packages. These cookies are amazing. If you don’t like nuts or are allergic, just omit them. Originally published on May 24, 2013, I updated this post to include step by step photos. Cookies! Okay, sooo I have an obsession with cookies and chocolate chip cookies. Each one I have made, I call them the best ever! Now everyone thinks I’m lying. I guess I have to say I have three favorite recipes. The recipe I’m sharing with you today is now in the top three too. Have you stayed at a Doubletree Hotel before? 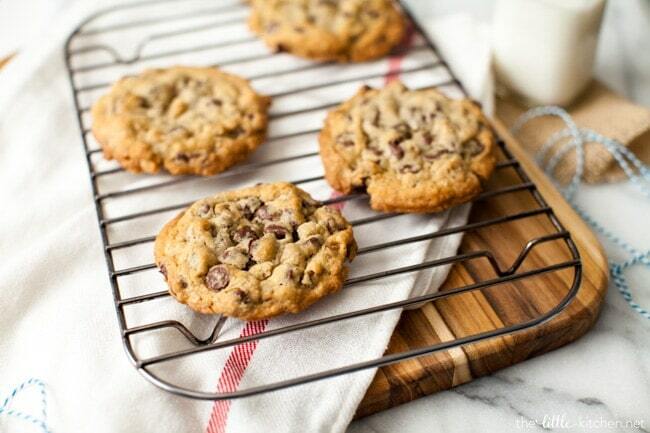 They give you these fresh-baked chocolate chip cookies and they are heaven. I’m so happy to have found a recipe in my searches, so I can make them at home! And I have to say, these taste even better at home. Once you make them for family and friends, they will ADORE you! I made these cookies for our food blogger bake sale this year! Huge thanks go out to all of the bloggers who participate this year: Katie’s Cucina (my co-organizer! here’s her recap), Kokocooks, Forkful, Live Pretty, Simply Southern Baking and My Sweet Zepol. We raised almost $700 for Share our Strength! 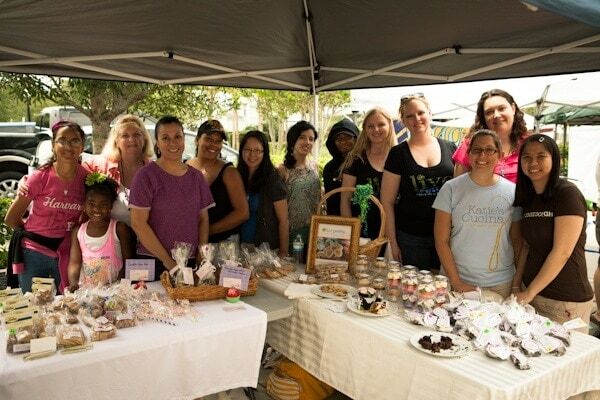 And huge thanks go out to the Winter Garden Harvest Festival — they let us combine our bake sale with their festival which was a blast! There’s our great group! What a lovely bunch of ladies! 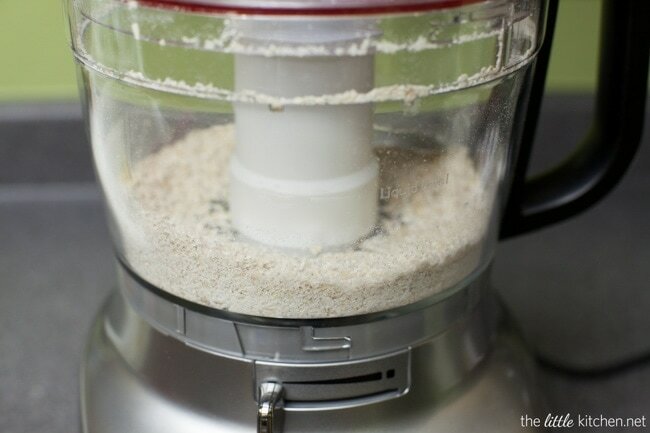 First things first, pulse the oats in a food processor. 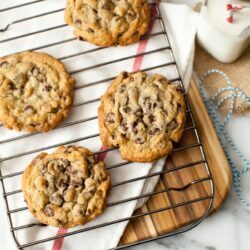 I usually will pulse at least 2 cups worth and store the rest in a jar in the pantry so I have some ready to go the next time I’m making these DoubleTree Hotel chocolate chip cookies again! I measure out and mix the oats, flour, baking soda, salt and cinnamon together with a rubber spatula. 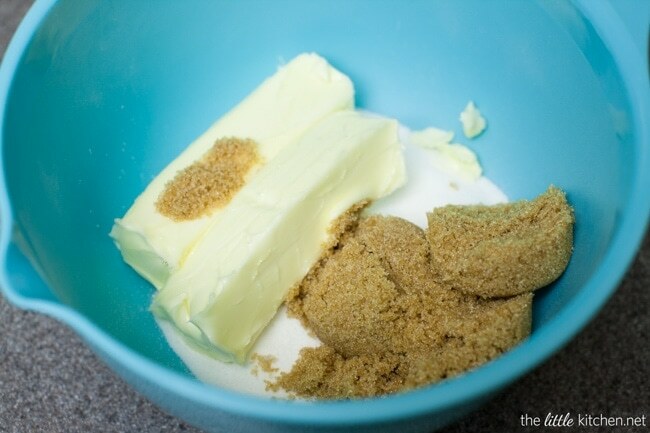 In another mixing bowl, add both sugars and the butter. Cream them together, they will look like this. Add vanilla extract, lemon juice and eggs, mix until smooth. Add the flour mixture in two batches. Add the chocolate chips and the chopped walnuts. Again don’t overmix the dough. And then portion out the dough using a cookie scoop. I used to make them huge (like you see above) but I like my dough to go further and make even more cookies for sharing or for those late night cravings. So I use a medium sized cookie scoop now (1.5 tablespoons). 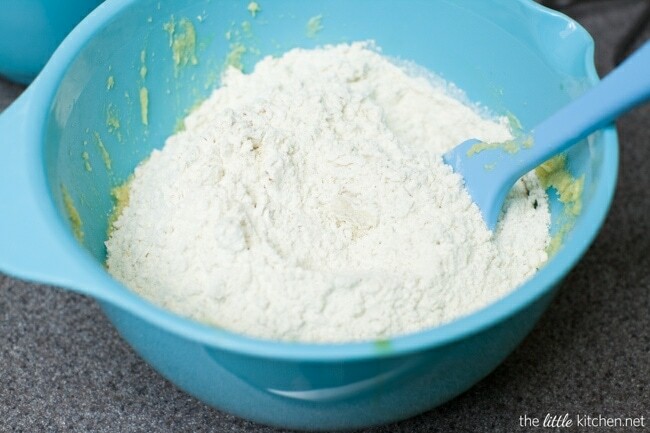 Portion the dough out because this makes your life easier. The dough has to chill and I hate trying to scoop out portions when the dough is rock solid from the refrigerator or the freezer. Chill the dough for a few hours and then bake to your heart’s content! 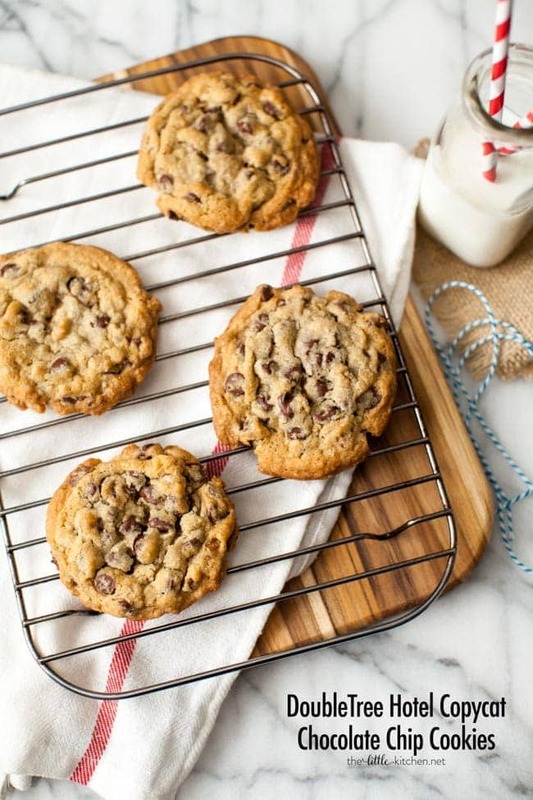 And about this DoubleTree cookie recipe…please make them! I put a quick video together on how to make them too! Enjoy! These chocolate chip cookies are to die for…they are my absolute favorite…I measure all cookies up to these ones! Having made these cookies a bunch of times, my favorite semisweet chocolate chips for this recipe are Ghirardelli miniature ones. Pulse oats in a food processor until semi-fine or fine. 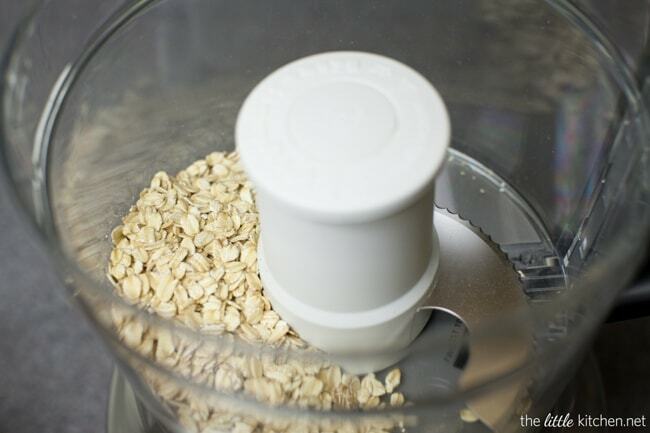 In a small mixing bowl, add the oats, flour, baking soda, salt and cinnamon. Mix thoroughly together with a rubbers spatula or wooden spoon. 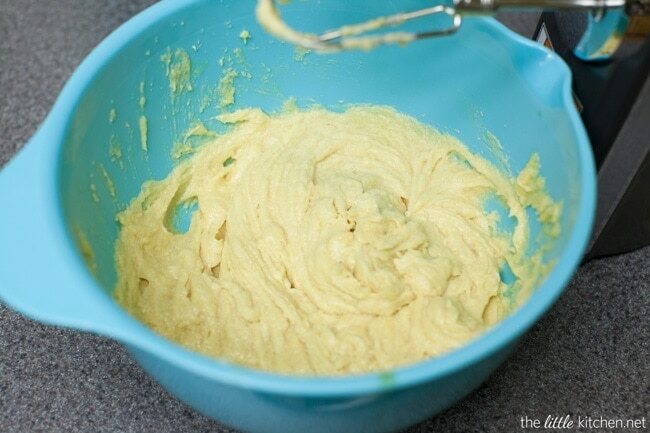 To a medium-sized mixing bowl, add butter, both sugars. Cream together using an electric hand mixer. Add vanilla extract, lemon juice and eggs. Mix until you have a smooth mixture. Be sure to scrape the bottom of the bottom of the bowl with a spatula at least once. 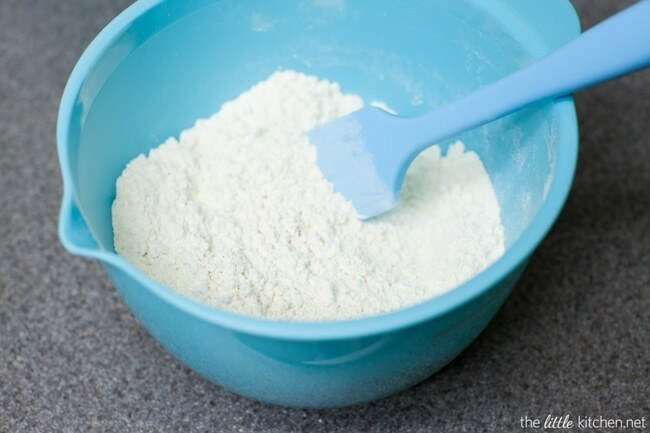 Add the dry ingredients to the wet ingredients and mix with a spatula, being careful not to overmix. 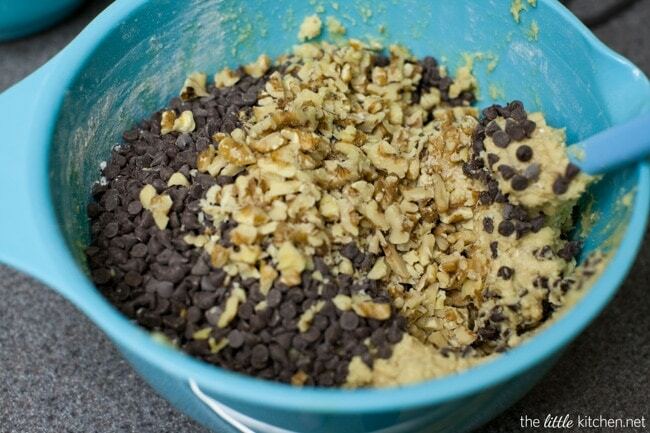 Drop in the chocolate chips and walnuts and mix until both are evenly distributed throughout the cookie dough. Again, be careful not to overmix or they will have a cake-like texture. 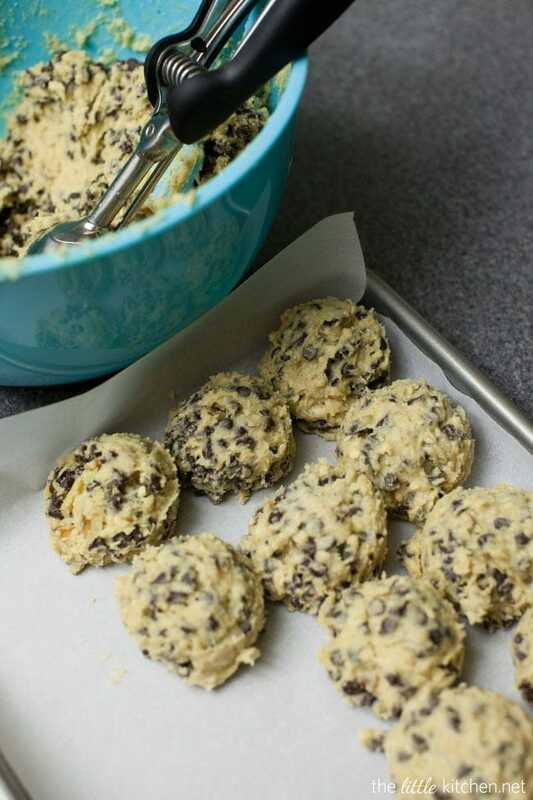 Using a large cookie scoop (3 tablespoons or you can use a medium-sized one to make even more cookies), scoop cookie dough onto a lined baking sheet. 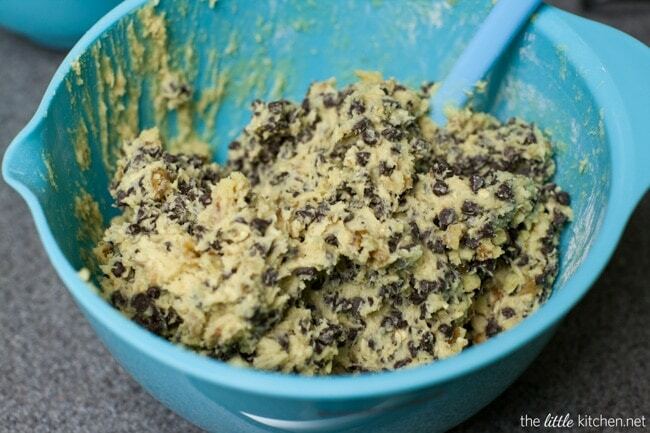 Freeze or refrigerate the cookie dough for at least 2 to 4 hours or overnight even. To bake: Heat oven to 350 degrees F. Place cookie dough portions onto baking sheet lined with parchment paper or a Silpat at least 1 1/2 to 2 inches apart. Bake for 13 to 14 minutes or until desired doneness (for smaller cookies, bake for 12 to 13 minutes). 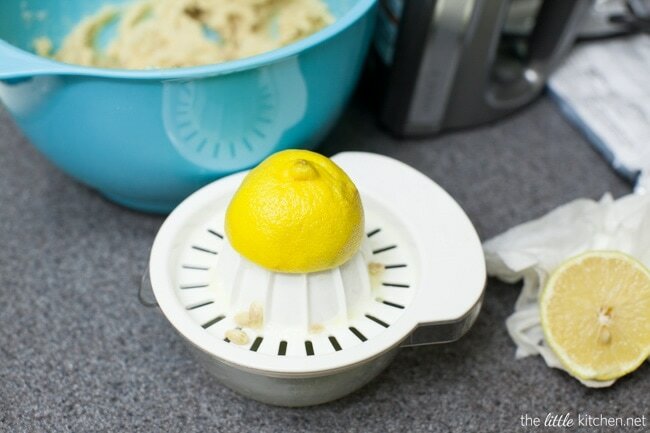 Allow to cool completely on a cooling rack if storing. Store in a sealed container with a slice of sandwich bread to ensure softness of cookies. 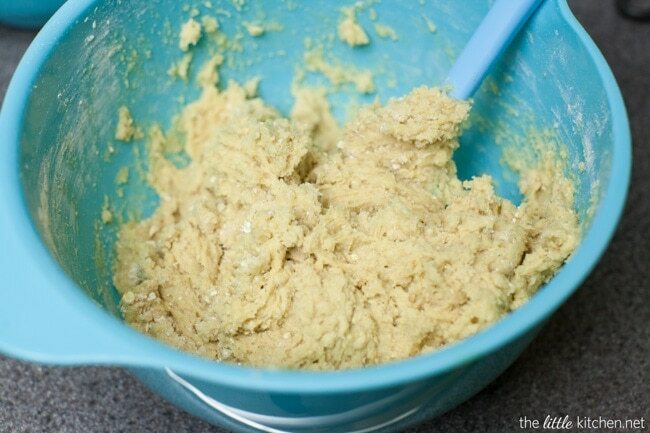 Tip: Freezing your cookie dough for later, let’s you have fresh baked cookies anytime you want them! 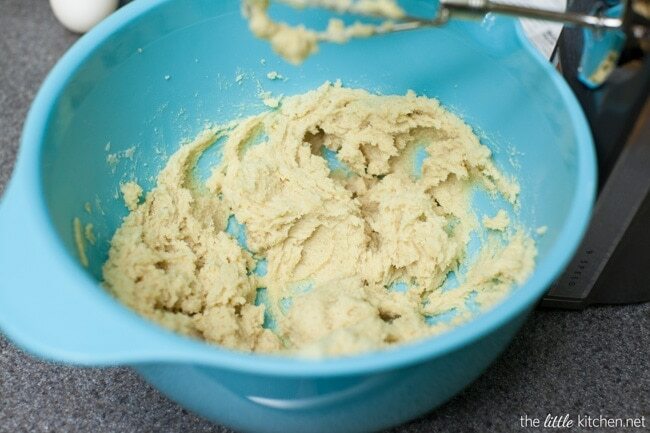 Here are some tips on how to freeze cookie dough. An update: I make these cookies ALL the time! I find that miniature chocolate chips work even better than regular-sized. And above is how I first freeze the dough right after making the cookie dough. 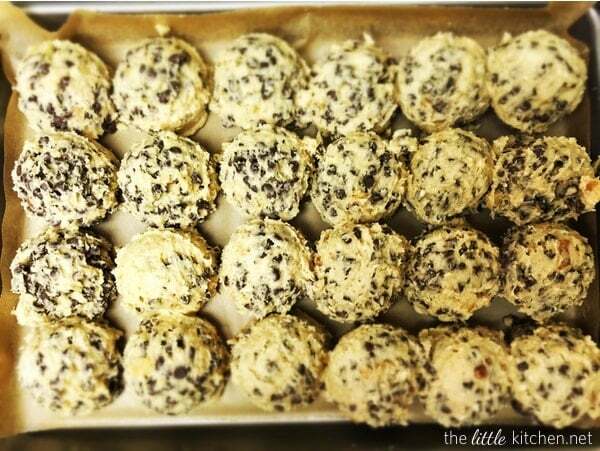 Check out how to freeze cookie dough.